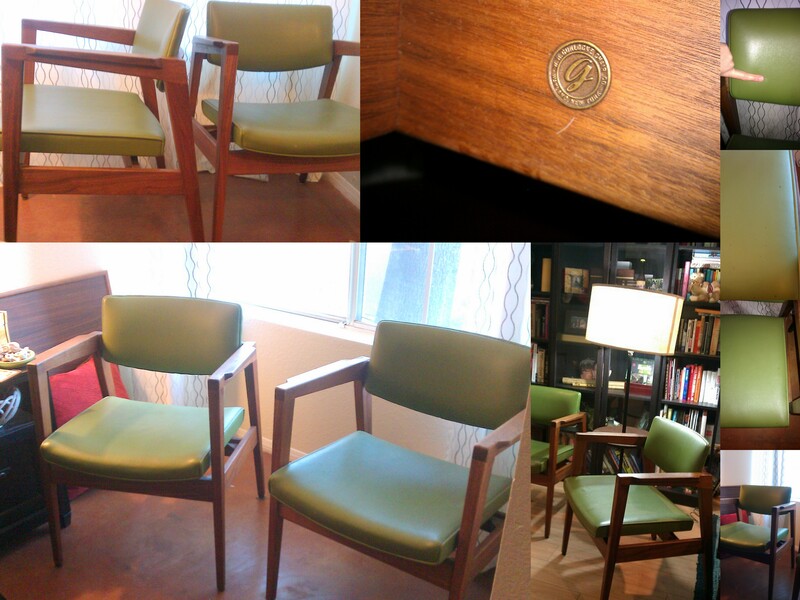 TWO Gorgeous 1960’s Mid Century Modern chairs from Gunlocke Furniture Company. These chairs are in their original faux leather/ vinyl. They are a beautiful soft avocado green and have amazing angular dark walnut frames. They are in amazing vintage condition. There may be a few scuffs here and there on the wood. One chair back has a small hole in the vinyl; the other chair back has a rubbed back edge. The same one has a few spots on the seat, not sure if they can come off or not. There’s NOTHING terrible or detracting from these amazing chairs. The modern angles of these two make a room. They are definitely eye-catchers for their clean, sharp angles and their amazing original condition. They have their original tags and company metal plates. Super solid frames, very heavy walnut wood. LOCAL PICK UP PREFERRED. OR EMAIL ME FOR ACCURATE SHIPPING COST!!!! PLEASE CONTACT BEFORE PURCHASING!!! !